Kelly was the best. It was my first time going to the mountains, and she made me feel very well with all my questions. I wish I had met her. I enjoyed waking up early, and having my coffee in the upper deck while everyone was still sleeping. Also, I ate every meal outside. The kids loved sleeping ad playing in the loft. I walked every day in the mountain. I even got to see from the deck a deer family going down the mountain. Easy to work with. Very helpful. Loved the property. Just what we were looking for. Remote but very nice. Great views. Very helpful and friendly. Info and directions were perfect. Enjoyed it immensely. Was the perfect spot for a family weekend. Open layout and loft allowed us to all be together while watching TV, cooking, and playing board games. I spoke with Kelly mostly and she was very helpful. She helped me sort everything out and find the place when I was too busy to notice the sign I passed. We will definitely be back again. We really enjoyed the relaxing nature of the property. When looking through other sites and cabins GSCR seemed "warmer" and a better option for us. The staff is very kind and knowledgeable. The property at Big Oak Pointe was fantastic. Great location and very clean. Lots of eating. Bryson city has great restaurants. What a fabulous cabin! We had a wonderful time and the accommodations amazing. Thank you for sharing this home with us. It allowed us the opportunity to explore the area and return home at night to a comfortable setting. Thank you for the forever memories. My boyfriend, excuse me my fianc and I had a blast here and yes he proposed at Charlie's Bunion hiking trail on March 31st. We truly enjoyed the cabin and look forward to our return. Great experience from the start! When I called to book, the woman told me a lot about the cabin I'd first mentioned. Then she asked what I was looking for and about our plans. After I told her more, she recommended a different cabin to suit our needs better. Now that's great customer service! Loved every minute of my stay at Dream Catcher. The cabin and property was gorgeous - exactly what I'd asked and hoped for. We loved sitting on the deck to take in the beautiful mountain ranges and blue sky. In the evenings, we enjoyed the hot tub and the warm fireplace. The location was perfect, too. 10-45 minutes from everything we wanted to do. The cabins looked gorgeous and the staff was so friendly! I was immediately sold! We came to celebrate out 32nd anniversary. Had a wonderful visit. 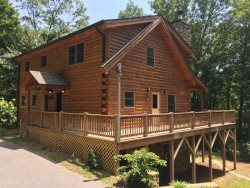 Beautiful cabin and great place to watch the NCAA basketball tournament! We had fun exploring the surrounding land. Thank you for sharing your cabin. It was wonderful and very relaxing!! A staff member did call us to see if we made it to the cabin yet but we hadn't at that time. We got there late and it was dark but the instructions were so well written that we easily found it. Nicest cabin I've ever stayed in. The view was amazing. Hot tube was amazing. Layout of the cabin was amazing. Everything was amazing.It was actually one of the first places we saw and as we looked at other places none of them offered as much as this one for the money. Most are a bunch of cabins in one area. This one you can't see any other cabin. You really do have your privacy. Your team was knowledgeable and courteous. We were very satisfied with the property. We particularly liked the location, which was very close to both downtown Bryson City and the national park. This cabin was the cleanliest cabin that we have ever stayed in and Bryson City is such a neat little town. We are so glad we picked this cabin and we hope to come back again. We had an amazing time. We enjoyed the relaxing nature of the cabin and location. It was a nice getaway break from'real life.' Can't wait to vacation here again! we plan on making it a yearly thing. Thanks for the amazing experience. Spring Break was great because of this trip. We watched the game every night and it was so fun. We had so much fun and the best part was the hot tub!!! I've never been here before and the experience in this cabin was amazing! The view from the Jacuzzi was breath taking. We will be back again for sure. Spring Break was great because of this trip. We watched the game every night and it was so fun. We had a great time and the best part of the cabin was the hot tub!!. I've never been here before and the experience in this cabin was amazing. The view from the Jacuzzi was breath taking, we will be back again for sure. We absolutely loved our stay! It was a fantastic place to celebrate our 1 year anniversary. We hope to come back soon. Loved, loved, loved our stay here at Dream Catcher! It was EXACTLY what I'd asked for and wanted and needed! We enjoyed walking with our dog at Oconaluftee, then as a couple at Deep Creek. Our time in downtown Bryson City was fun, too. And Asheville! The cabin was wonderful and perfect for us. We loved the fireplace and the Hot Tub! Our 5 year anniversary is coming up in May and we've actually decided to change our plans so we can come back to BC and rent from GSCR!! That's how wonderful this has been for us. Thanks for the great time and memories! Loved, Loved, Loved our stay at Dream Catcher! It was exactly what I'd asked for and wanted and needed. We enjoyed rafting with our dog at Oconoaluftee, then as a couple at Deep Creek. Our time in down town Bryson City was fun. The cabin was wonderful and perfect for us. We loved the fire place and the hot tub! Our five year anniversary is coming up in May and we've actually decided to change our plans so we can come back to BC and rent from GSCR. That is how 3wonderful this has been for us. Thank you for the great time and memories!